CiCi’s has been long known for their delicious dessert pizzas. With chocolate pudding and pizza dough, you can turn a couple of basic ingredients into much more. You can make this easily at home. You can make CiCi's famous chocolate pizza at home. Prepare pizza dough as directed on the package. Spread and shape dough on greased pizza pan. Pierce dough with fork 8 or 10 times. Place in preheated oven at 450 degrees for 5 minutes. 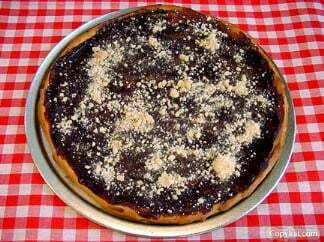 Remove from oven and spread 3/4 cup of chocolate pudding on dough, sprinkle with 1/4 cup of crumb topping. Place back in oven and bake for 18 - 20 minutes. Crumb topping should be a little crisp. Mix flour, sugar, brown sugar, and salt. Place butter with mixture and blend until the crumb topping resembles corn meal. This is a great little topping for fruit pies or deserts. This recipe does not make sense. It says at the very end how to make the crumb mix but you’re only supposed to put a fourth a cup of it on the item before you bake it well what do you do with the rest of it then? What is the crumb topping mix made of? Thanks for the Cici’s Chocolate Desert Pizza. My particular favorite was a carmel or butterscotch creamy topping on Cici’s pizza. Much to my disappointment, it seems to have been discontinued. Can you help? Thanks for whatever you can do. I bet you it could be done the same as above. Look for the long-cooking pudding and make it the same way. It’s worth a shot, esp. if you make your own pizza crust or find it really cheap. I believe that was bavarian creme that it used to be.